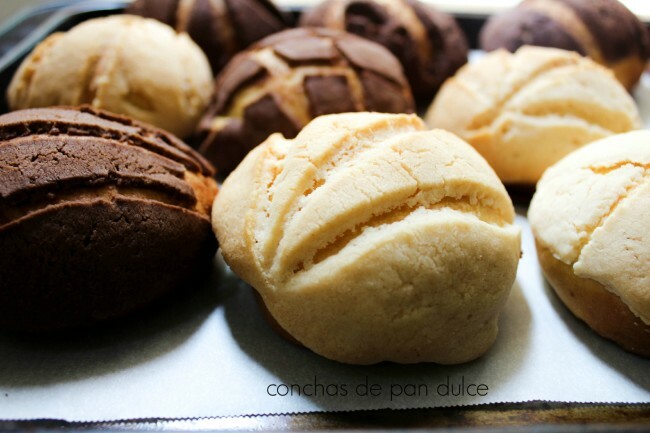 There has been so much going on lately, I couldn’t wait to take a pause and bake these conchas de pan dulce. I couldn’t wait, but I just couldn’t seem to find the time! When you make a yeast bread, you have to set aside time. Really, that’s all. Time and patience. Lots of patience! 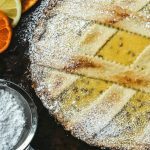 I couldn’t wait to explore ideas for a Mexican bread (and it’s Cinco de Mayo!) when Heather chose our #TwelveLoaves theme. I couldn’t wait, yet I was not really sure which way to go. I was interested in something savory and I kept leaning towards semitas (sesame seed bread). When I saw some other members of the group were making them, I thought it was better to share something different and to create some variety for our fun theme!! What are conchas named conchas (seashell)? It’s pretty easy to figure it out when you see their seashell shape. The crust is a thick and sugary. When you take a bite, it’s a little bit crispy and it crumbles. Once you brake through the sweet and delightful crust, you get to enjoy the soft and fluffy roll. 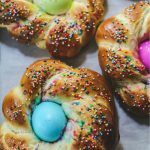 It’s a sweet bread made with flour, butter, yeast and eggs. It happens to be one of Mexico’s favorite sweet rolls, and when you make them, you’ll realize why! As I mentioned, all you need is time to bake them. The process is not as difficult as it seems. I have my in-laws here from Italy for a while. When my mother-in-law found out I was baking something, she was asking some questions. 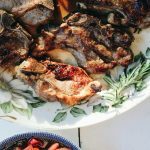 I had a sneaking suspicion she may have put an Italian twist on this recipe (it’s hard to say no to her! ), so I asked my hubs to take my in-laws on his errand while I made this bread!! I used to remember coming across a few blogs when I first started blogging that shared stories with their posts. They weren’t bloggers that shared 3-5 recipes a week. Maybe 1-3 recipes a week, but they also had a story. Back then, those were my favorite sort of blogs to visit. 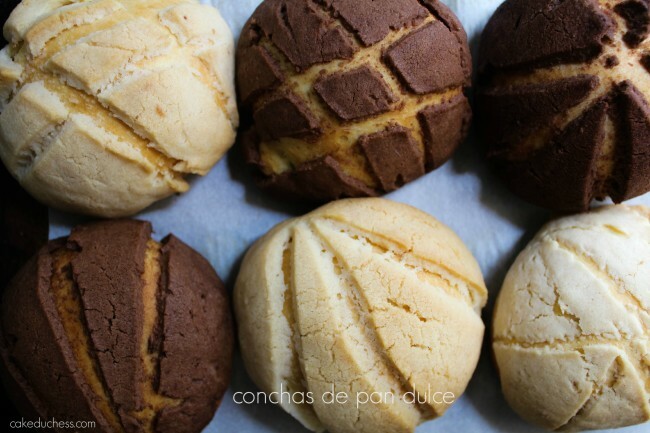 I couldn’t believe how happy I was to read the story that accompanied this recipe for conchas. 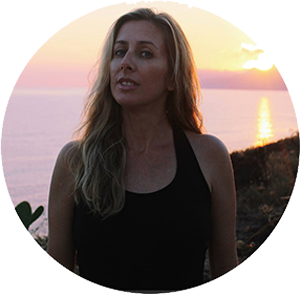 “I drove home feeling more than a little annoyed at myself for wasting my precious gasoline and getting laughed out of every Mexican bakery in town. 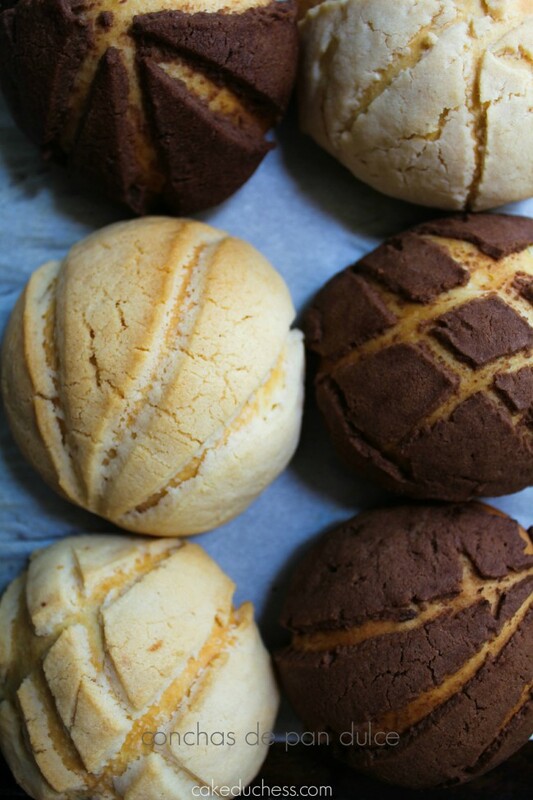 Foolish to think any panadero [baker] in his right mind would hand over to a stranger with a blog his super secret recipe for pan dulce. I got down from my car and walked up to my gate. It was then when out of the corner of my eye I saw her step out of the shadows. She was all ruby lips, high cheekbones and flowing dark hair. There was a pair of 5-inch heels on her feet and a peacock blue satin sheath on her curvaceous canela-colored body. “Espera—wait!” I cried after her, but it was too late. I ran up just in time to see her shiny black ’59 Chevy Impala roaring past me. Its back lights grew ever smaller as I stood silently watching them before they disappeared onto Whittier Boulevard. And that was the last I saw of her. This is just an excerpt from the story that drew me in while I was looking for my conchas recipe! I loved hopping around checking out her other fantastic recipes and storied. It’s too bad it seems she stopped blogging 3 years ago. But if you have a few minutes and like Mexican food, you have to see what else she shared, besides these lovely conchas! I used my sweet dough recipe that I use for mostly every sweet sort of bread and the topping recipe and process from A Little Cup of Mexican Hot Chocolate. The dough is super easy to put together (it’s the same dough I always use for sweet types of bread). Just make sure you leave enough time in your day to wait for it to rise. When it was ready, I measured out 14 balls of dough that weighed about 50 grams each. I had a small glass that was about 2.5 centimeters in diameter. I used that glass to cut out the circles of the topping. I obviously didn’t divide my topping correctly and ended up with more plain topping than chocolate. Next time I will divide it evenly, because everyone was fighting over the chocolate conchas! I didn’t roll out my plain topping first, and I should have! If you roll out the chocolate topping first, the board and rolling pin gets messy with chocolate. So roll out the plain topping and then the chocolate one. Use a very sharp knife when you cut out your shell design! When you roll the chocolate topping, it may stick if it isn’t chilled very well. Use a little cocoa powder to help you roll it. The topping is very delicate. 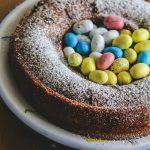 It may break a little while baking and your shell design could completely change, and that is ok! Some of my shells turned out perfectly, some, not so much! But I think the variety of shells is what makes them so beautiful, just like these conchas!! My kid’s observation: “Mom, this is so interesting….the crust, the cinnamon. You should open a stand at the Green Market.” I was told this twice, so I guess the conchas turned out ok!! Make the chocolate and vanilla-cinnamon topping: In a medium bowl, beat 2/3 cup sugar, cinnamon and ½ cup butter until fluffy. Stir in the flour and mix until it resembles a thick paste. Take half of it and set it aside. Take the other half and mix it with the powdered cocoa until well blended. Wrap the toppings in plastic and put them in the refrigerator to firm up. 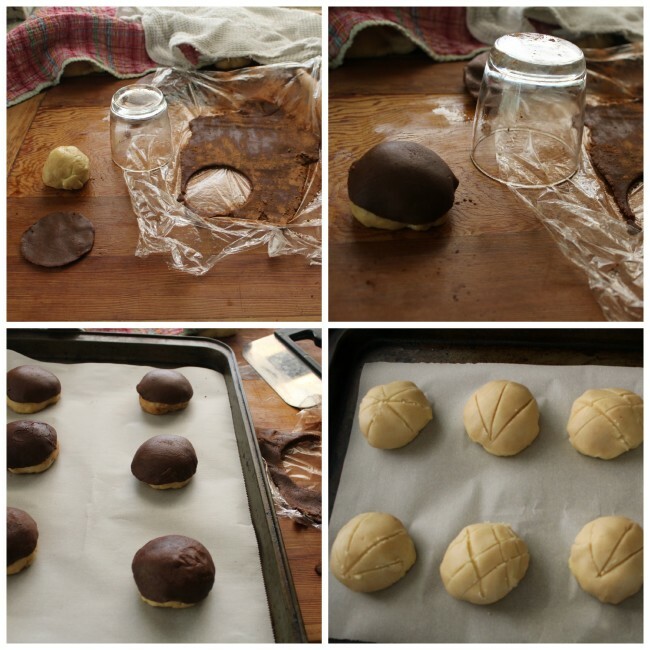 Cut and shape the dough into 12 – 24 balls, depending on the size you want (I made 6 chocolate and 8 plain. With the leftover dough, I made cinnamon rolls). Line a cookie sheet with lightly greased parchment paper. Place balls on the cookie sheet and gently flatten each ball with the palm of your hand. Space balls 2 ½ – 3 inches apart. Roll out the chocolate and vanilla toppings under plastic wrap. Take a bowl or a glass that is wider than the balls of dough to cut the topping into circles. Use a steel spatula to gently lift each circle and carefully place over each ball of dough. Very carefully score the toppings to make shell designs. Be sure to use a very sharp knife. Gently place it over each ball of dough. Preheat oven to 350° F. Let the balls rise for another 20-30 minutes. Bake for about 20 minutes or until golden brown.